This makes a lovely brunch-time dish or starter, hot or cold. Preheat the oven to 190°C, gas mark 5. Brush a 15cm square of shortcrust pastry with melted butter and put Brie (½cm or so thick) in the centre, leaving a 3cm border all the way round. Drizzle honey over and sprinkle thyme leaves on top. You can add figs, onion slivers or slices of any other fruit or veg you like. Fold the naked 3cm edge of crust over to form a parcel-like tart with an open middle. 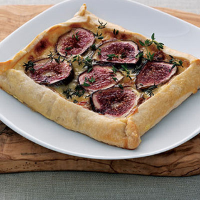 Brush the exposed pastry with an egg wash and bake for 15 minutes or until cheese is melted, figs or other fruit or veg have caramelised slightly, and, most importantly, the crust has turned golden.